It is sometimes difficult to imagine a world where children don’t go to school and are unable to read and write. Unfortunately, it’s a reality for many. In Haiti, more than 500,000 primary-school-aged children are unable to go to school. As a result, about 50% of the country is illiterate (Poulin, 2012). There are various reasons for these tragic statistics, but one cause in particular is the fact that most schools in Haiti are private. Private schools constitute seventy percent of Haiti’s education sector, meaning education is expensive. According to the Ministry of National Education and Vocational Training, school fees can total between forty-five and sixty percent of the average annual income of a family with three school-aged children (Poulin, 2012). As imagined, this makes education a luxury few can afford. Families work to scrape up the money every year to put their children in school. Oftentimes this means fewer meals as well. Malnourishment then ensues and makes it difficult for children to do well in school. Schools are affected by low enrollment, too. When fewer children can afford to pay school fees, schools do not have the funding to hire better teachers and purchase necessary supplies. This results in a lower quality of education. 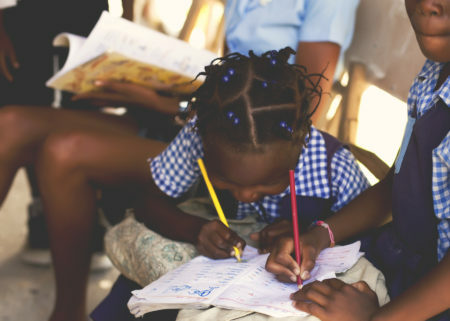 There is no question that primary education in Haiti is in a crisis. Breath of Life Haiti sees this need and aims to solve it through its primary school program. Just $20 per month provides a child with an education and daily hot meal. It is convicting to think of the many alternative ways we may spend that $20 in day-to-day life. This is the time of year when we reflect on our blessings and consider the way we can give to others and make a difference in the lives of our brothers and sisters in Christ. Matthew 25:40 says, “Truly I tell you, whatever you did for one of the least of these brothers and sisters of mine, you did for me.” I pray that somewhere in this season of thankfulness and giving, you find the faith to do something for the least of these.